The Blacklist: Season 1 - Lovely Washington, DC home that is way beyond the means of the 30-something couple that lives in it because one is a school teacher and the other is in law enforcement. I did a little research and learned that in the late 80's my mom decided to splurge on four hand crafted Thomas Moser dining chairs. At the time they were about $600 a pop (now they are $1075). Clearly my mom didn't tell my dad how much they were until after the fact because THAT IS SO MUCH MONEY! 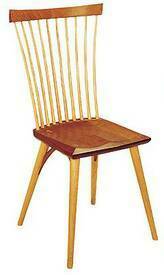 The four Moser chairs are still around our dining room table, and in pretty near perfect condition. In one of the first few episodes of The Blacklist, a psycho killer breaks into the home of our heroine and holds her husband hostage in their dining room. But of course, I was distracted by the chair behind her head. It looked so much like the ones my parents have (but not the same). My super 80's mom should be telling my sister to get off that chair! This picture of me shows not just Thomas Moser chairs, but also a Thonet nock-off rocking chair. Double whammy!